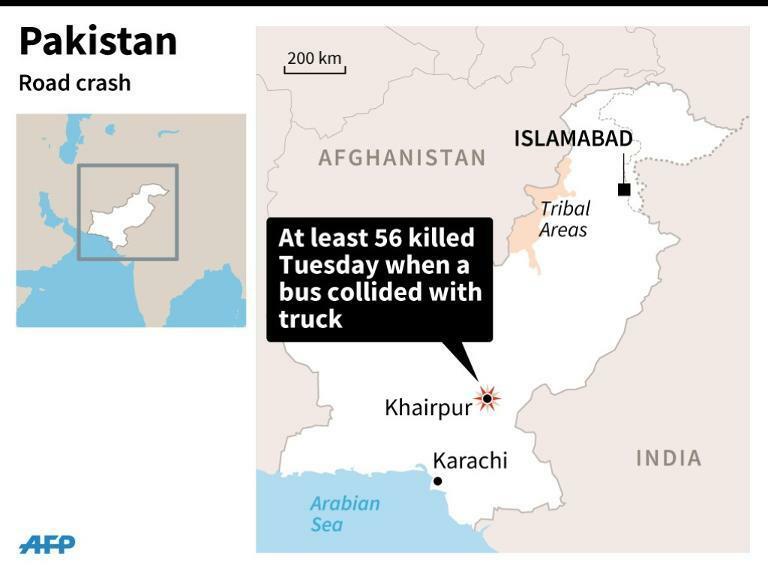 At least 57 people, including 18 children, were killed Tuesday when a bus collided with a goods truck loaded with coal in southern Pakistan, officials said. The accident happened near the city of Khairpur, 450 kilometres (300 miles) north of Karachi, the capital of southern Sindh province. Pakistan has an appalling record of fatal traffic accidents due to poor roads, badly maintained vehicles and reckless driving. Crashes killing dozens of people are not uncommon. Television footage of the aftermath of Tuesday's crash showed the mangled bus lying on its side, its roof completely sheared off and battered green seats scattered around the scene. Doctor Jaffer Soomro told AFP that 57 people were killed and 21 injured. Police said there were 17 women and 18 children among the dead. "The accident was so severe that all of them died at the spot," except for one child who died undergoing treatment in hospital, Soomro told AFP by phone from Khairpur Civil Hospital. "I have never seen a road accident of such a horrible magnitude." The bus was carrying Pashtun families from northwestern Swat valley to Karachi, and medical staff were struggling to communicate with some of the injured, who spoke only the Pashto language. "We have called Pashtun translators to communicate with the surviving people especially the children who are in very miserable condition," Soomro said. The details of Tuesday's crash are still not entirely clear. Initial reports said the two vehicles collided head on, but later police said the bus hit the stationary truck after pulling out from a fuel stop. A.D.Khawaja, the Motorway Police chief of Sindh province, told AFP the poor condition of the road may have been a factor, as well as bad driving. "There was a deep ditch on the road which we call 'rutting' some 30 to 40 yards before the place where the bus hit the truck," he said. "We have learned that the bus went out of control after it hit the rutting and it landed on the opposite side of the road and then hit the truck which was coming from Karachi." Senior police officer Faisal Chachar, who is in charge of the stretch of highway where the accident happened, said that not long before it, the bus driver had been fined for overloading his vehicle and forced to set down four passengers. He said the bus and the truck had both been travelling at around 80-90 kilometres per hour (50-55 miles per hour) when they collided. "We had to call mechanical cranes and cutters to separate the bus and trucks and the bus was compressed completely," Chachar said. The recovery equipment available to Pakistani emergency services is often basic, and when crashes happen away from major towns, rescue efforts can take some time, reducing injured passengers' chances of survival. In April a bus smashed into a tractor-trailer in a high-speed collision in Sindh, killing 42 people, while in March a horrific crash between two buses and a petrol tanker left 35 dead, with many burned alive when the fuel ignited. The mountainous areas of Kashmir and the north, where drivers career around narrow hairpin bends over deep ravines with scant regard for safety, are particularly prone to accidents. Three crashes in the space of 10 days in March in Kashmir and the northwest left a total of 46 people dead.